This week's question: What sacrifices have you made for your writing career that you're better for? I’ve not thought much about sacrifices when it comes to writing. Most of the time, I feel mighty blessed to be sitting at my computer making up stuff. However, I can come up with a few things that I've given up in the pursuit of the written word ... things that I'm often all the better for having missed. The biggest one would have to be time, but it is time I give up willingly. I've rarely turned down a social engagement to write, even with deadlines. I simply work my day or week to accommodate. The hours I spend in my office have meant sacrificing clean cupboards and floors on occasion, but I probably would have found something else to do anyway if I wasn't writing. Now and then, my husband has come into my office to chat with me, and usually I stop what I'm doing to share a coffee, but not always. Those times I regret, but happily, they're the exception. I've sacrificed money by visiting conferences and throwing launches, among other costs. Yet, I don't regret the outlay. I've visited places I never would have ... Monterey, Phoenix, Baltimore, Cleveland, Chicago, Washington, Muncie, Victoria, Vancouver ... and I've met many, many interesting people along the way, some who've become friends. The monetary sacrifice has paid enormous, incalculable dividends. Perhaps a more esoteric sacrifice would be giving up my comfort zone on occasion. I'm not entirely at ease thinking about being in front of a crowd and have spent many hours with a queasy stomach, going over my spiel again and again in my mind on the day of a presentation, event or media interview. 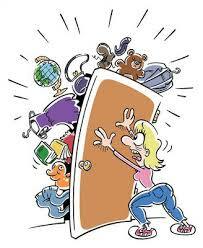 The nervous feelings have lessened over the years, but have never entirely deserted me. I try to look at time in the spotlight as character-building - easier to convince myself of this benefit after everything is said and done. Yup, that's me at the lectern. A butterflies-in-the-stomach moment. While I'm on the subject of intangible sacrifices, I'd have to add my ego. There's something about standing in a bookstore while people avoid you like a dose of plague that knocks out any feeling of self-importance. My favourite bit of knocking down came during my earliest years as a published author. My first series was four young adult mysteries and I was invited to teach at a kids' festival. One little girl, who was about eight years old, put up her hand and all but shouted, "My mom said I could either buy your book or the kitty cat purse ... and I picked the purse!" The delight in her voice still makes me laugh. It continues to remind me that not everybody will put my writing above a bubble gum pink kitty cat purse. Nice post, Brenda. Your story about the book or the kitty purse made me smile. Thanks Dietrich - It was one of those moments that continues to make me smile. I have to ask - that photo shows you in front of a huge audience, an experience we would all kill for. I experienced it at the Tucson Festival of Books, where even that isn't a really big audience. but where were you and what was the occasion? 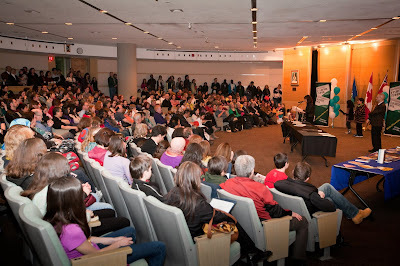 I was a judge in a library kids' writing contest and this was presentation night in Ottawa.